TATA's uphill fight is not about producing quality cars like Jaguar or Landrover but about making their existing customers comfortable in dealing with them. We had a TATA Indica Xeta which we sold for 40k after spending over 1L in its last 3 years of the decade long ownership. If only Tata brings up effective measures on giving their existing customers peace mind for a minimum of 10 years then only they will see their sales gain steam. They need to make the service transparent, acknowledge the manufacturing defects even after end of warranty period, make their spares affordable and make their dealers toe the line. They have to take each and every niggle like a life threatening incident and act upon them diligently even to the point of issuing recalls or at least in making the process of getting replacements less hindered by fleecing dealers. They should not bank on just making the car more VFM and feature rich but on keeping their sales starved dealers in check to make their products a grand success. Last edited by COMMUTER : 26th June 2017 at 07:42. The fact that Tata is selling a good number of Tigors already, shows that pricing for the car is just right. If they just include airbag+abs in lower variants, they would definitely start undercutting the sales of other manufacturers. It can be assumed that they would update the line up in future by bringing the amt and if the demand surges and brand value is gained, probably better engines also. 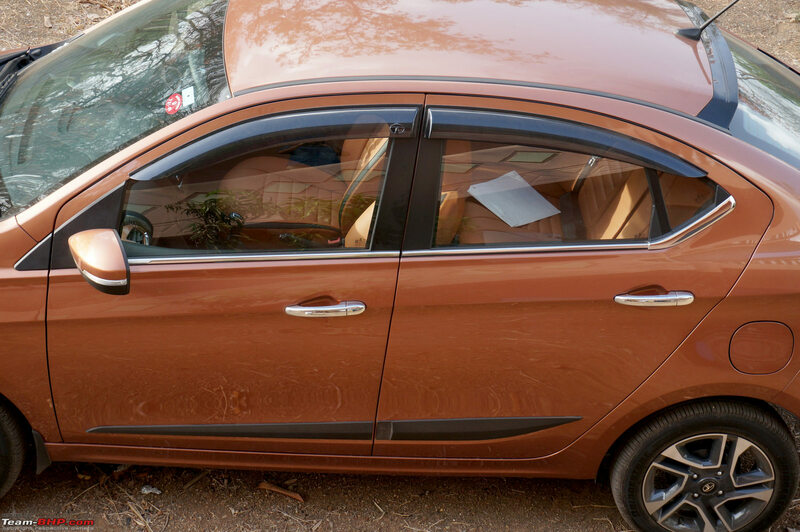 The Tata Tigor is on sale in India at a price of between Rs. 4.70 - 7.09 lakhs (ex-Delhi). One of the best reviews I've come across. The attention to detail is commendable. This was much awaited! Big shoutout to BHPian amrutmhatre90 for letting us drive his family's brand-new car for this review. Thank you! Many thanks amrutmhatre90 for lending your car for the Team-BHP Review! Those seat covers look sweet! Please post some more pics of the seat covers and interiors of your car if its ok with you. Mod Note: Please discuss only the Tigor on this thread. We have other threads to discuss Tata's after-sales & reliability. Thanks! 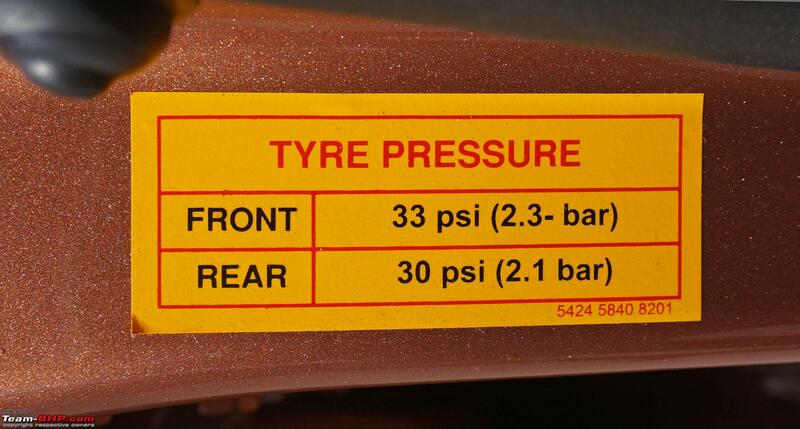 What's going on with the tire pressure ratings? 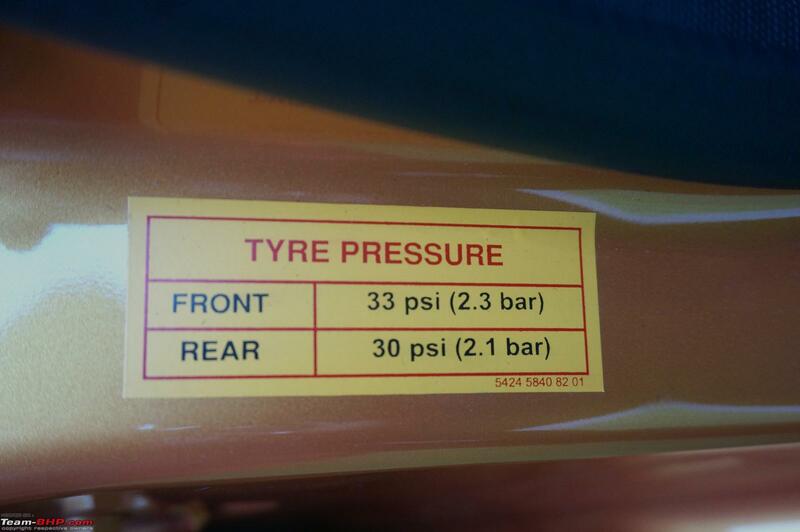 Probably a mix up at either end - TATA mistakenly using the Tire pressure sticker of Tiago in Tigor, or TBHP wrongly using the image of the same. Even the number in red on the bottom LHS of the sticker matches. Edit: Great review nonetheless, especially overcoming the handicap of not having the car from TATA for an extended period of time to author the tbhp standard of review, thanks to @amrutmhatre90. Last edited by blackasta : 26th June 2017 at 09:36. Perhaps the two pics are from diesel & petrol. 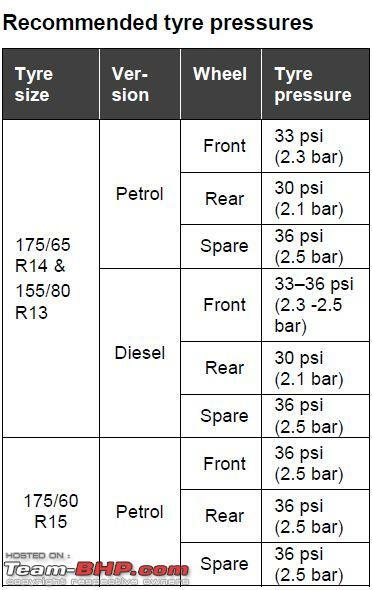 Rims & tyre sizes are different for the two so it is possible that recommended pressures are different. Reviewers will be the best persons to clarify. 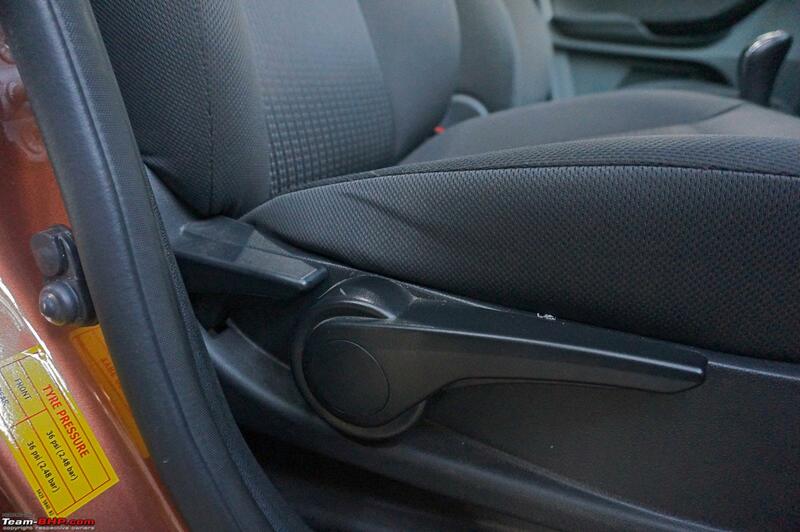 In Tiago, the driver's door handle can be pulled half way to unlock all doors, similar to how it is on the Punto. Not sure how it is on the Tigor. Thanks for pointing it out. Sorry for the lack of clarity. I assure you that the image is not the same one used for the Tiago. Thanks for a good review of the Tigor. Many thanks to Amrut Mhatre for lending his car. After going through the review, I have listed some of my observations below. 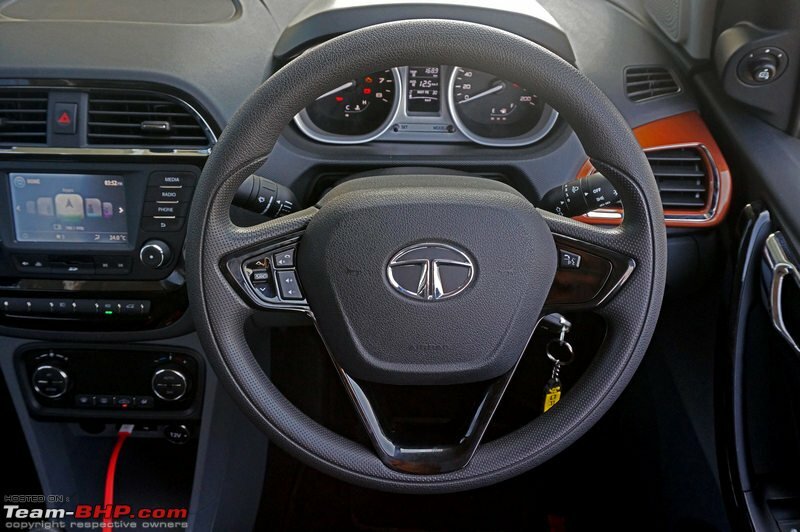 The steering wheel has high gloss black insert for the spokes instead of the silver one in the Tiago. The lock is not made from steel so it won't rust. Locks are usually made from die cast aluminium alloy. The brownish colour is dust mixed with lubricant. It's true that to unlock all the doors at once you need to lift the driver side lock. But all the doors unlock automatically once the key is removed from the ignition lock. They lock automatically once the car exceeds 10 km/h. The side air vents have very limited adjustability. This means that cold air is always blowing on the driver's right hand when on the steering wheel. Cooling vent in the glovebox. The boot lamp is linked to the cabin lamp and also has the dimming effect. The car comes with just 1 remote control flip key. 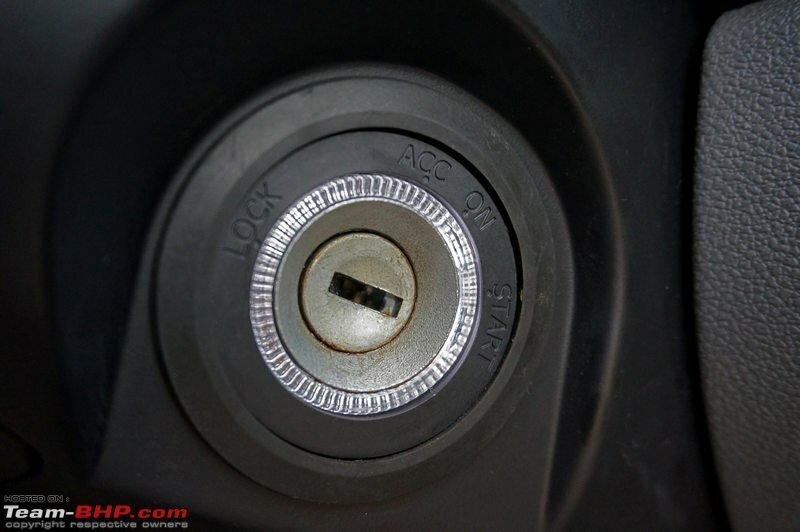 The regular key is the spare and it also contains the RFID chip for the immobiliser. The animated GIF for the boot is a nice touch! Thanks. At higher speeds, you get the confidence to chuck the car around a little due to its weight. By weight do you mean steering weight or vehicle weight? We felt that initial brake bite is missing, but after that, they are progressive and do the job as expected. That initial lack of bite will take some getting used to. This lack of initial bite is only a perception based on experience from Hyundai and some other brands who make their brakes grabby. I prefer the linear response that Tata or Maruti provide. Service intervals are too frequent - every 7,500 km / 6 months. IMHO, no car should be visiting the workshop more than once a year for periodic maintenance. 10,000 km / 1 year is the ideal service interval. The service interval is short but oil changes are scheduled for every alternate service. Incidentally, synthetic oil is used in both the petrol and diesel engines. The car is away at farmhouse, will be going on the weekend. Surely will click pics of seat covers. Well it was fun having the car for a Team-BHP review. When heard about the media drive car not available again, some one had to step up. I decided to bite that nail. Everything is nicely put up by Omkar, one thing would like to tell people who are looking forward to this car, the ride quality is amazing. I drive an Ertiga Diesel, we had to go back and forth on the same road once in Tigor and once in my Ertiga, the roads were mess at some places. In the Tigor I could easily go over rough patches with much higher pace than in my Ertiga. Impressed with Tata's the effort put in the car it shows its good. ...the ride quality is amazing. I drive an Ertiga Diesel, we had to go back and forth on the same road once in Tigor and once in my Ertiga, the roads were mess at some places. In the Tigor I could easily go over rough patches with much higher pace than in my Ertiga. I have a Tiago and I have to agree with you. The ride over rough roads is so good that it feels like I'm driving a car that's 2 classes higher and double the price! I'm exaggerating but only a bit. It looks like Tata is the new Fiat when it comes to ride quality. If I am not mistaken, even the Zest is a sub-4m sedan, isn't it? Doesn't this make Tata the only manufacturer to have two compact sedans in its portfolio? Isn't that a bit of an overkill, considering it cannibalizes their own product? Or maybe they've decided they will not compete in the City/Ciaz market at all. I must confess, the Tigor does look splendid. Zest is a more powerful vehicle, atleast in its 90HP guise. I believe Zest's days as a private vehicle are over. They might be targeting taxi market with Zest once Tigor gets a firm toehold in CS market. I wish Tigor has a more powerful engine. Excellent review as always. So its pretty evident that its an excellent offering with decent quality let down only by the engines. Hope TATA is reading the reactions and works on improving them. Tiago segment can have a 3cyl heart but a sedan(no matter how small) ought to have decent performance. Maybe, maybe-not. Tigor no matter how good it is to look at, does look smaller(Actually narrower) than competition in flesh. Whereas ZEST looks at par with competition size-wise. I believe TATA should seriously introduce this 'impact design'(or whatever they call it) philosophy to ZEST and style it similar to TIGOR with proper 4 cyl mills. They can continue the current ZEST for fleet market(ala Dzire 'tour') and introduce a ZEST styleback for private market with proper 4 cylinders. That can be placed above TIGOR in terms of pricing and would be more competitive offering considering the competition. Last edited by SoumenD : 27th June 2017 at 11:43. In addition to a more powerful Tigor and a taxi market Zest, what Tata essentially needs is a sedan. There is no use pinning hopes on Zest, it's like flogging a dea horse. The attributes of Zest, except for its boot, make it ideal for taxis.